Mardi Gras, Fat Tuesday, or Shrove Tuesday whatever you call it, it spells fun! Here is how to make a Parakeet Bird Mask craft for kids of all ages (preschoolers love the feathers). Have a parade with these phineas and african art mask and Shrove Tuesday activities. Enjoy! 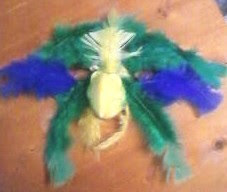 Make a Mardi Gras Mask Parrot Parakeet Feathers. 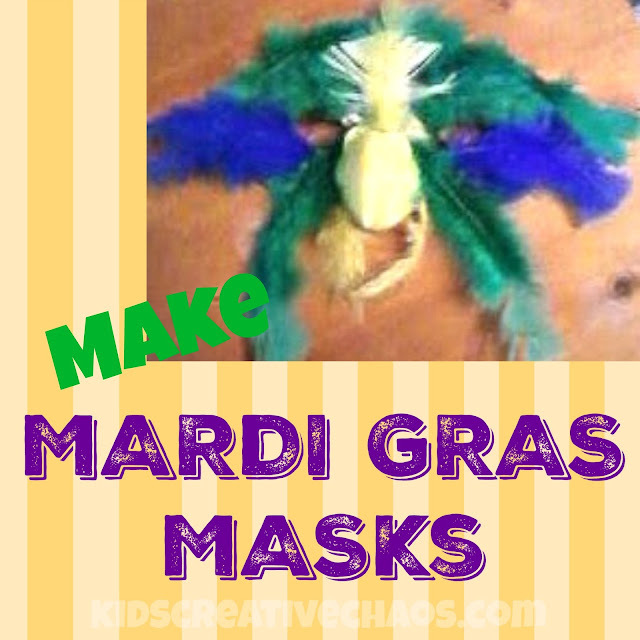 Mardi Gras mask for kids. Well, pickle biscuits! That nose is a half-mask from Oriental Trading Company. I can't find it anywhere now. It came in an assortment of animals noses including: dog, elephant, duck, parakeet, and cat. I got a dozen for less than $5. You might check the Dollar Tree. Masks for Mardi Gras Crafts. For the bird mask above, I used a heavy duty glue stick with a large dose of patience. Glue the Nose on first and then plan the feather design by laying them out before gluing. Stick feathers up under the mask and tuck the tips under the plume of the other feathers. The masks above are available for less than $1 each on Amazon.com. Click the link below the image to purchase. Feathers are fun. I can't hide them from the cat!